This is one of the best demonstrations in chemistry. Make a solution and then watch as it changes from amber to blue to colorless and then watch as the solution repeats the process again and again. Learn about the mechanism and chemistry of the Briggs-Rauscher Oscillating reaction. 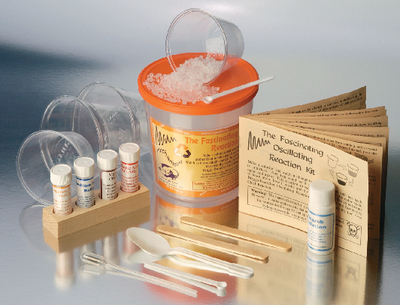 Kit contains: Malonic acid, manganese sulfate, sodium iodate, sodium thiosulfate, sulfamic acid, starch solution, vial rack, cups, spoon, scoops, stirrers and instructions. You supply 3% hydrogen peroxide solution.